Make sure your desk is in the proper place. Use appropriate artwork and imagery. Balance and harmonize the space. Choose suitable feng shui office colors. 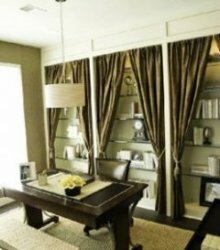 One of the most fundamental steps in creating a feng shui office is to get rid of clutter. If you've read about clutter control then you know that clutter has a profound impact on your emotional, mental, physical, and spiritual well-being. When you clear clutter you bring in vital energy that will help you with mental clarity, focus, and inspiration. A clutter-free and organized office allows room for new, refreshing energy and ideas. Create an organization system that works. You need to establish a personal work-style so that you can maintain a clutter-free, organized office. Keep everything that you use daily within arms reach. You shouldn't have to get up from your desk to perform daily tasks. You should also deal with paper work at least once a week. It won't be nearly as overwhelming if you do your filing, pay bills, open mail, etc. consistently. Here are a few other things to keep in mind: try to leave your desk clutter-free and organized at the end of the day; don't overcrowd your bookshelves, it will leave you feeling overwhelmed and overextended; and if your space is cramped, then open it up with mirrors. 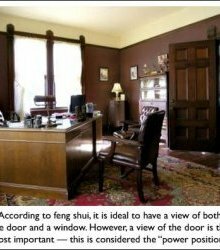 In a feng shui office you want to make sure that you are sitting in the power position. That means that you can see the door when seated at your desk. Ideally, you should be able to see as much of the room as possible. The diagram below illustrates how to place your desk in the power position. 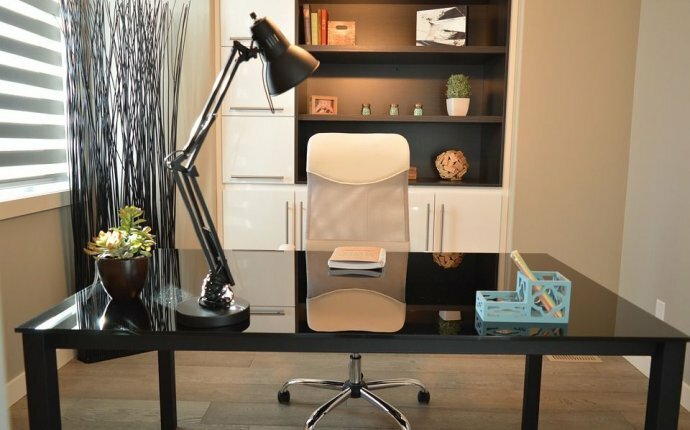 The placement of your desk is one of the most important feng shui adjustments you can make. Did you know that in feng shui the person seated farthest from the entrance will have the most power? Sitting in the power position is a key element in a feng shui office. The person seated farthest from the entrance will have the most power. If you sit too close to the door, you will be distracted by daily/petty details. If you sit with your back to the door, you will suffer inauspiciously to office politics, backstabbing, etc. If you have to share your office space with another, you should try to avoid sitting back to back. It is also best to avoid sitting face to face. Both positions tend to create conflict. If you canâ€™t avoid sitting face to face, either stagger the desks or create a small barrier with a plant, photo or other object. Concentrate on acoustical privacyâ€”use headphones and muffle phone conversations. In an open plan with many desks, use plants to soften sharp edges and corners. Sharp edges create â€œpoison arrowsÃ¢â‚¬? which contribute to conditions such as irritability, discomfort, and even disease to name a few! Also, the aisles should be large enough so that the energy moves slower. Make sure to use subtle colors in an open office plan. Bright, vivid colors are too active in a large bustling room. And of course, your desk should be uncluttered and organized. . 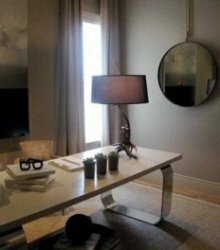 In a feng shui office you want to surround yourself with images and objects that keep you inspired, creative and productive. Add flowers, art and beautiful window treatments. Hang pictures, mottos and images that symbolize what you want to accomplish. Choose furniture and accessories that speak to you of prosperity, abundance and success. You can use your office as a template for what you want to create in your life and work â€” your office and the physical objects within should reflect the transformation you desire. Read more about and . Infuse your office with your personality—it will foster and support personal growth and success. Every object in your office has an influence on you — Carl Jung called this numinosity. Make sure your office is having a positive and uplifting effect on you! 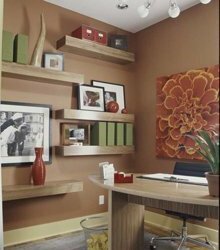 Balance and harmony are important attributes of a feng shui office. There are two ways to balance and harmonize your environment â€” you can either use or . Yin and yang represent feminine and masculine energies. Nourishing energy strikes a balance between the two extreme forces of yin and yang. Let's say for example you worked in an overly yang environment with high ceilings, light colors, angular furniture and lots of natural light. You would need to balance this overly yang environment with some yin energy. You might add curved or flowing shapes, darker colors, soft furniture and some window coverings. Feng shui elements represent the natural elements of wood, earth, metal, fire water. It is important that all five elements are represented in your environment. Even more important is that the elements are in balance. When the elements are in balance then your life is more likely to be in balance and you will have greater success in manifesting what you desire. @Darth Talon: Does anybody else design their wardrobe/room/office around their feng shui? Best kan? I totally believe in chi.